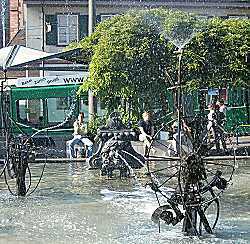 Swiss artist Jean Tinguely is famous for his moving objects and nonsense machines. For several years his Great Illuminator could be seen in the entrance hall of Basel's central railway station, but in the course of a major redesign of the station it has been removed. 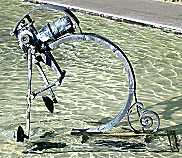 Still to be seen is the Tinguelybrunnen [fountain] in front of Stadttheater (Steinenberg / Theaterstrasse). 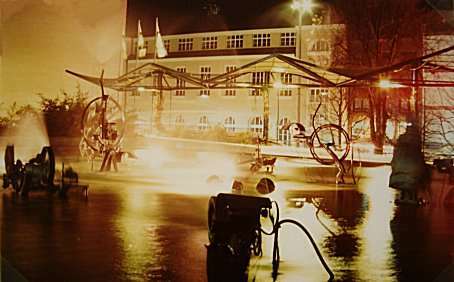 This fountain consists of a series of individually moving water-pipes. 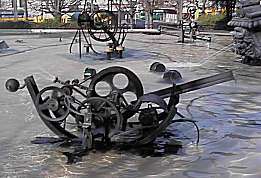 Some of the moving parts do just spray water in all directions while the fruitless efforts of others like this shoveling machine (left) and this sieve moving up and down (right) do remind of the ancient Greek myth of Sisyphos. 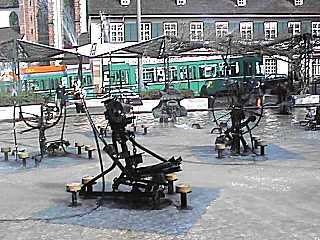 Tinguely Fountain is located in front of the theatre between Steinenberg and Theaterstrasse.